This newly released image from ESO’s Very Large Telescope in Chile shows planetary nebula Abell 33. Astronomers using ESO’s Very Large Telescope in Chile have captured this eye-catching image of planetary nebula PN A66 33 — usually known as Abell 33. 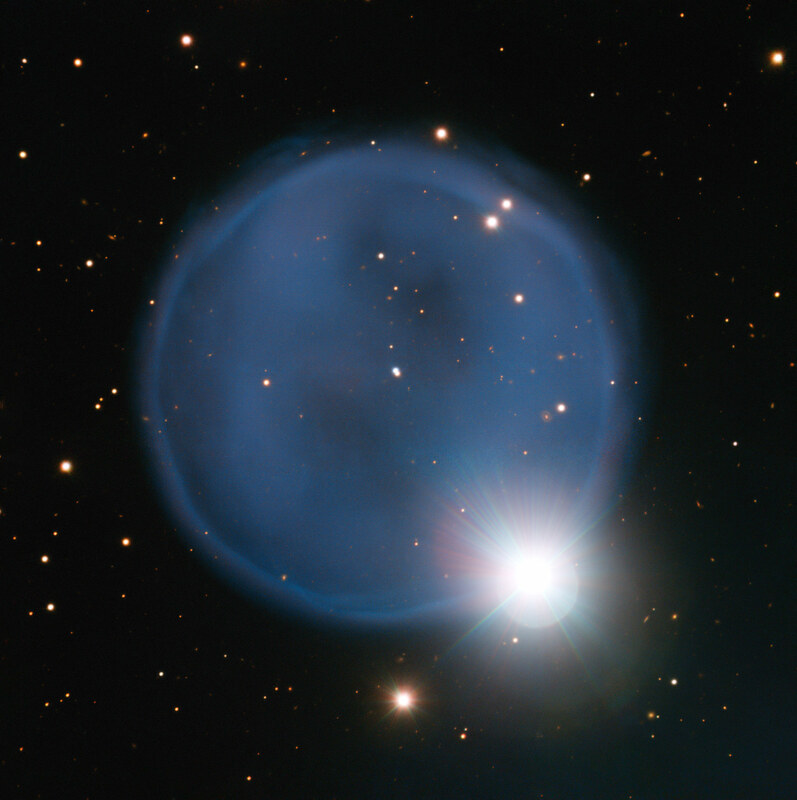 Created when an aging star blew off its outer layers, this beautiful blue bubble is, by chance, aligned with a foreground star, and bears an uncanny resemblance to a diamond engagement ring. This cosmic gem is unusually symmetric, appearing to be almost circular on the sky. Most stars with masses similar to that of our Sun will end their lives as white dwarfs — small, very dense, and hot bodies that slowly cool down over billions of years. On the way to this final phase of their lives the stars throw their atmospheres out into the space and create planetary nebulae, colorful glowing clouds of gas surrounding the small, bright stellar relics. This image, captured by ESO’s Very Large Telescope (VLT), shows the remarkably round planetary nebula Abell 33, located roughly 2,500 light-years from Earth. Being perfectly round is uncommon for these objects — usually something disturbs the symmetry and causes the planetary nebula to display irregular shapes . The strikingly bright star located along the rim of the nebula creates a beautiful illusion in this VLT image. This is just a chance alignment — the star, named HD 83535, lies in the foreground of the nebula, between Earth and Abell 33, in just the right place to make this view even more beautiful. Together, HD 83535 and Abell 33 create a sparkling diamond ring. 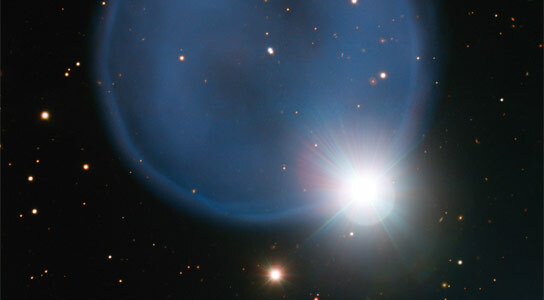 The remnant of Abell 33’s progenitor star, on its way to becoming a white dwarf, can be seen just slightly off-center inside the nebula, visible as a tiny white pearl. It is still bright — more luminous than our own Sun — and emits enough ultraviolet radiation to make the bubble of expelled atmosphere glow . Abell 33 is just one of the 86 objects included in astronomer George Abell’s 1966 Abell Catalog of Planetary Nebulae. Abell also scoured the skies for galaxy clusters, compiling the Abell Catalog of over 4,000 of these clusters in both the northern and southern hemispheres of the sky. This image uses data from the FOcal Reducer and low dispersion Spectrograph (FORS) instrument attached to the VLT, which were acquired as part of the ESO Cosmic Gems program . For example, the way the star spins, or if the central star is one component of a double or multiple star system. In this very sharp image the central star appears to be double. Whether this is a real association or just a chance alignment is not known. The ESO Cosmic Gems program is an outreach initiative to produce images of interesting, intriguing or visually attractive objects using ESO telescopes, for the purposes of education and public outreach. The program makes use of telescope time that cannot be used for science observations. All data collected may also be suitable for scientific purposes, and are made available to astronomers through ESO’s science archive. Be the first to comment on "ESO’s Very Large Telescope Views Planetary Nebula Abell 33"